Nalesniki, aka ‘cheese crepes’ are a staple recipe in every Eastern European kitchen. These crepes are filled with a creamy cheese mixture and can also be filled with raisins, dried cranberries or even apples. I like to serve mine with fresh berries on top. 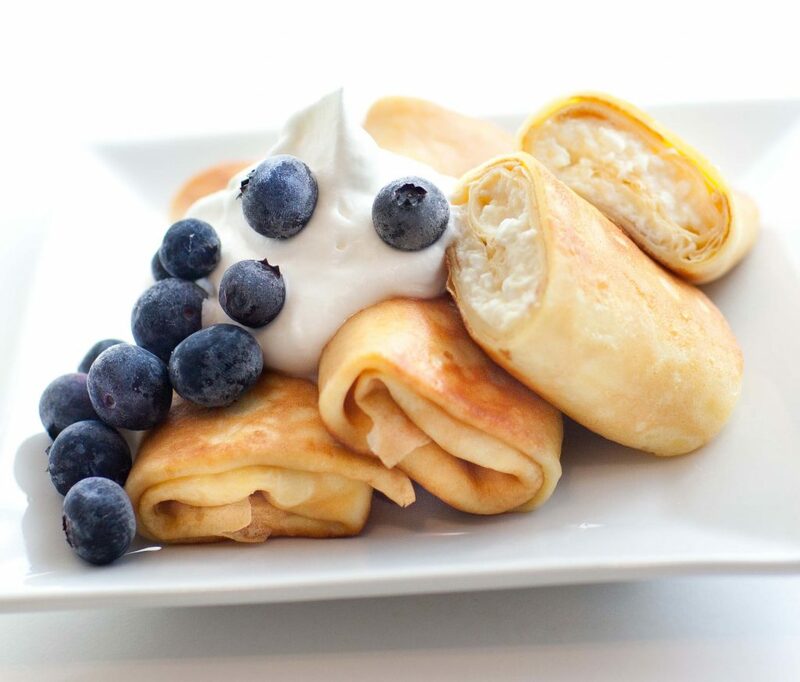 Any way you prefer them, these cheese crepes are sure to be delicious! Serve them with berries and whipped cream! It is important to have all ingredients for the crepes at room temperature before mixing to avoid clumping. Whisk together eggs, butter and milk. Gradually add sugar and then flour. Whisk until no clumps remain. Preheat an 8-inch non-stick crepe pan or frying pan over medium heat. Add 1/4 cup of batter at a time to the pan, tilting the batter around the pan to form crepe. Turn crepe once sides start turning golden brown. Preheat oven to 350F. Place all filling ingredients into a large bowl and mix with a spatula until well combined. Place a generous amount of filling in the center of each crepe and fold as you would an egg roll: sides folded in first, then roll from top. Place seam side down into glass baking dish. Bake for 30 minutes; bake the first 20 minutes covered with foil and the last 10 minutes without the foil. 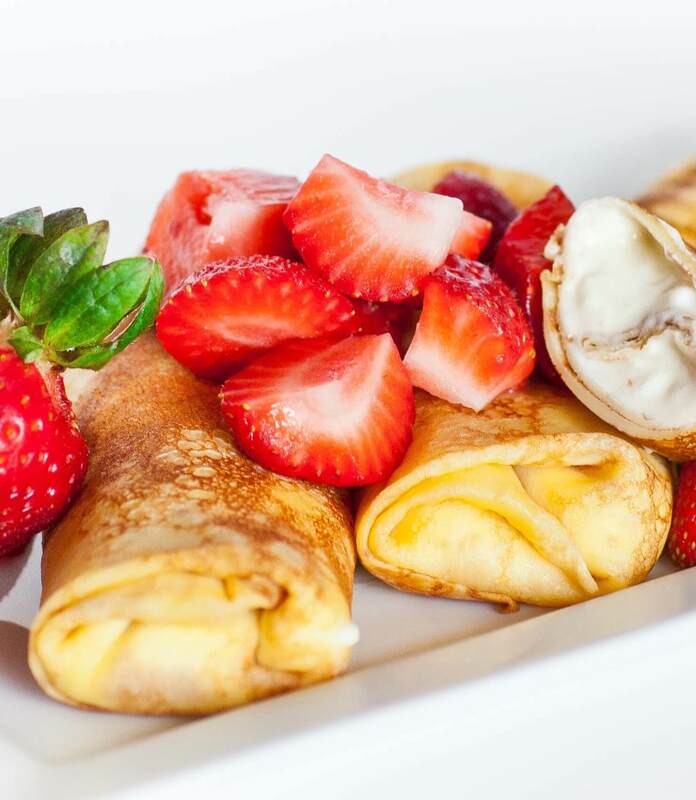 Let crepes cool slightly before serving with fruit and/or whipped cream. Thank you for sharing this recipe. Tomorrow, I will definitely let you know how they turned out. I see you’re making my mom style to put in the oven for 20 min and i really love when Nalisniki putted in the oven. They are much softer and delicious. And wow three cheese filling it is interesting… I need substitute ricotta cheese because we’re not fan of it. I hope Crape or Nalisniki without feeling will turnout good… I already tried couple of the recipes and I didn’t like how Crepe Tasted. These look scrumptious! I noticed you have two slightly different crepe recipes. In one you use 4 eggs, in the other – 5. Also one has 2 tbsp sugar and the other has 1/4 cup + a teaspoon of vanilla extract. Could you tell me what kind of difference it makes and which you prefer? Thank you!